I won’t lie to you. I do have quite a large clothing (and shoe and accessory and bag) collection. Some might say I have knitwear coming out of my ears. But I’m very strict with my wardrobe. I’ve mentioned this many times on Little Bird – I clear out my closet on the regular and eBay/donate/chuck anything that’s no longer suitable, whether due to a change in style, size or general preference. And that means I’m left with only the things I love. So it’s no surprise that I wear the same pieces in quick succession. I have my favourites, and I wear them again and again and again. My tendency to wear the same necklace/coat/shoes/jeans time after time is a regular topic of discussion in the comments – apparently, lots of you wear your favourite purchases all.the.time too! With the exception of the gloves (which were £7 in Primark – BUY THEM, they’re amazing), you’ve seen everything here before. Heck, I wore the coat-and-necklace combo mere days ago. But surely that’s just a reflection of normality? In real life, we wear the same clothes day in, day out. 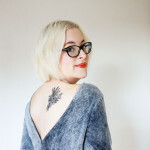 And why should a fashion blog be any different? I’m so enamoured with my Zara faux fur gilet, it featured in outfit posts four times in three weeks before I decided to give it a break. 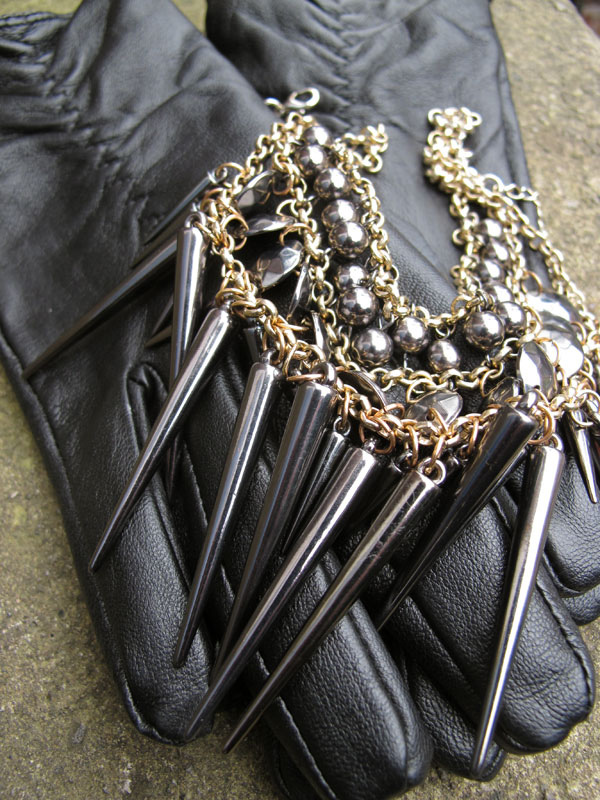 And I’m sure you’re all sick of the sight of my favourite ASOS necklace. But if it can be reworked with fresh accessories, a different lipstick or new shoes, I’ll love it forever. Take a look at how I’ve worn each piece in this outfit a different way and tell me – what’s most-worn in your wardrobe? It’s so good to read a blog that is honest.. Sure, if I had all the money in the world I’d probably wear something different everyday. But I don’t. So I just hope I mix what I’ve got up a bit and wear it with style. Very much like yourself..
i can see what you mean, as you see some blogs and you think do you really go out like that?! i only post about the things i would wear on a daily basis and that normally includes a lot of topshop! 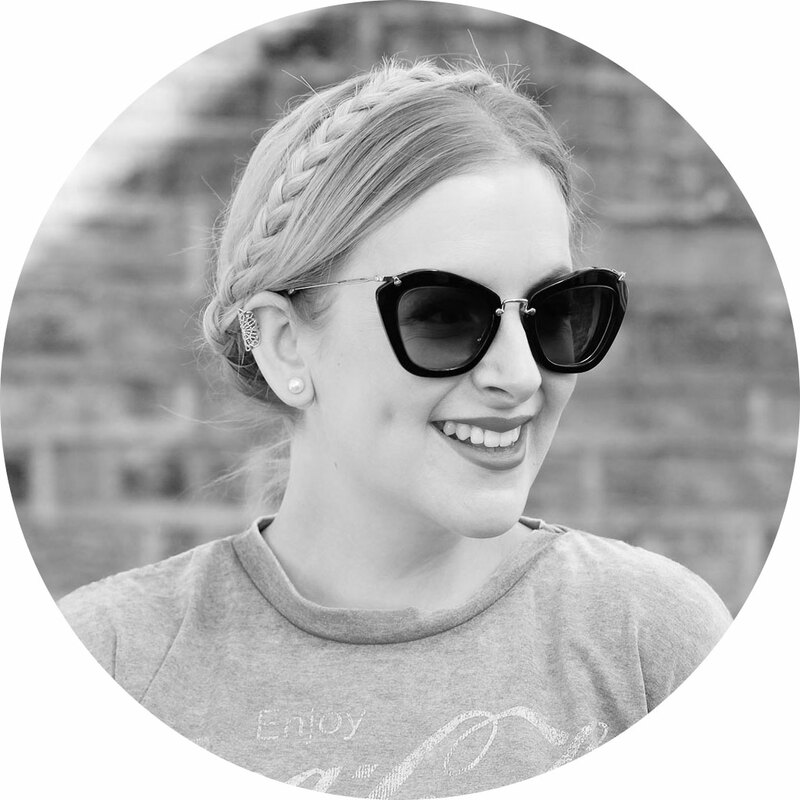 Your blog has always been a much more accurate reflection of real life fashion. In reality we can’t wear a brand new outfit everyday. I wear the same things over a over again and I like blogs that show me how to wear the same in different ways, it’s much more inspiring and useful! Great post. This is actually one of the reasons I really like LLYMLRS – she wears the same stuff all the time and I think it’s great. Whenever I’m contemplating not posting my outfit because I’ve worn the same jeans 3 times already that week I always think to myself ‘What would Lily do?’ and post away! I still can’t get over how bloody fantastic that coat looks on you! Hi Jen you look like the female equivalent of dashing, or dandy! 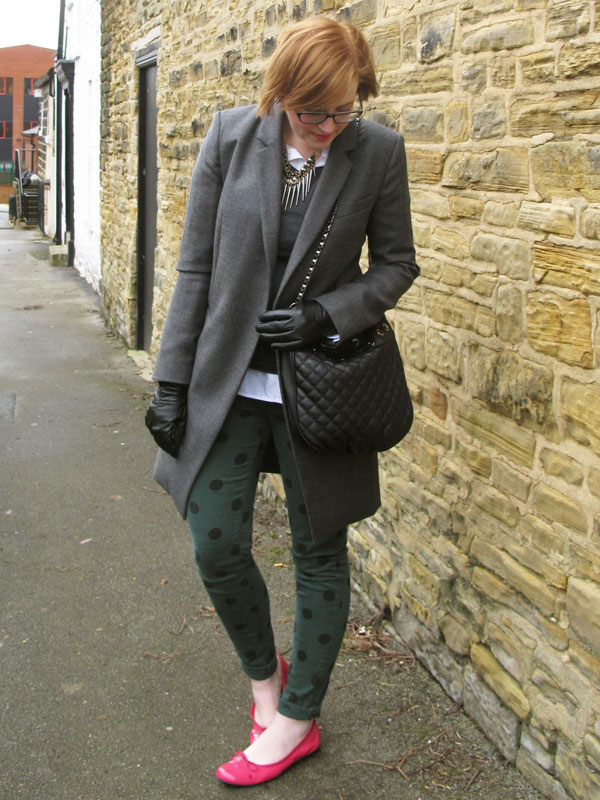 Love your grey frock coat and spotty jeans! Love this post, I always rewear my clothes and find it bizarre when some people seem to have a new addition to their wardrobe every day!! !This has also inspired me to have a (much needed) ebay/charity shop/recycling sesh….watch out wardrobe!!! I definitely wear things to death. I’ve had to throw away so many shoes because they’re beyond re-heeling. I recently bought some ‘riding’ boots from M&S and haven’t taken them off since. Yes! I don’t make a habit of buying new clothes every week so like any other person, I have my favourites and wear them to death! I quite like the idea of routinely clearing out clothes to make rooms for pieces you love. I should start doing that too. I love your coat here Jen and your hair is beeyootiful! I wear the same thing a lot. I just can’t help myself…if it fits and makes me feel good of course I want my money worth! I do love those jeans, I wish I’d got my hands on them when they were available! I think as a blogger you always feel guilty for wearing the same stuff, but I have unashamedly worn the same skirt and boots for about the last 3 outfit posts! You are right- in real life people are lazy! My skinny jeans are undoubtedly the most worn items in my wardrobe! I do the exact same thing, I mean if I love something, or I love a combination of course I’m going to wear it again probably a lot. I’ve heard some people say you should never wear the exact same outfit, but it think thats silly. Sometimes I get into a loop of the same clothes, and I like to mix it up. Jen I am really loving your style at the moment. Those jeans are beauts! 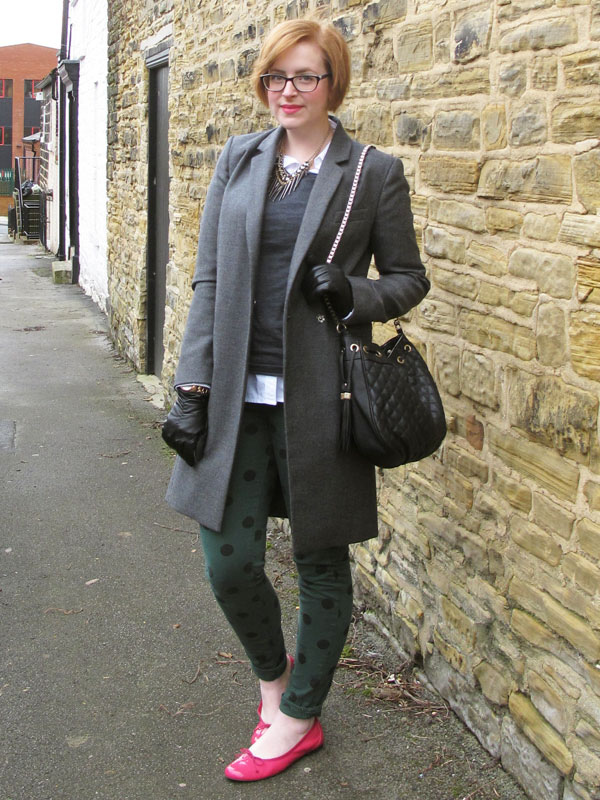 I tend to get a favourite outfit and wear it a few times running (with washes I might add!) currently it’s a burnt rust coloured sheer shirt, blue skinnies, black wedges topped off with a heap of chunky jewellery. Its just good sense in an economy after all!